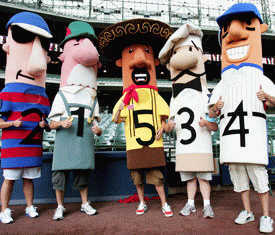 Chorizo will join the Bratwurst, Polish Sausage, Italian Sausage and Hot Dog for a race on "Cerveceros Day" -- that's "Brewers" in Spanish for you gringos -- following the sixth inning of Saturday's Brewers-Reds game at Miller Park. Chorizo will then be "optioned out to the Minor Leagues for more seasoning," according to Melvin, though there is also the issue of Major League Baseball's approval process for new mascots. The Sausage Race will officially become a five-weenie affair beginning on Opening Day of 2007. This is a big deal here in Wisconsin. Really. Anybody ever had a chorizo? Basically my life is just hard work, I can say that I live a seventy-year-old, is not that comfortable life than a month, like pushing a stone up the mountain, the stone kept rolling down and Tuishang Qu. Well, maybe once. In TJ. It was dark, I was drunk and very uncomfortable when I woke up. Almost 20 years ago(!) I was in Austin, MN for a couple of weeks. I was amazed that I actually met some Mexican migrant workers that far north of the border, working the farms. So it's not that surprising to me that they're now getting their own mascot in Milwaukee. Chorizo is a spicy breakfast sausage. It looks like a sausage link, but I've never heard of anyone eating it that way. Typically you'll squeeze it out of the casing into frying pan. It'll break apart even more as it cooks. When it's almost done, scramble it with some eggs to make "huevos con chorizo". Spoon that into a flour tortilla, add some salsa, and you've got a breakfast taco.